Rosh Hashanah is a time of renewal, an opportunity for a fresh start. It is a time when we resolve to have a better year. Each of us has unlimited potential and capacity for greatness. Hashem has given us all a unique set of skills and talents that when applied properly can have a monumental impact. This Rosh Hashanah, let us commit to using our individual strengths to make a difference. Throughout history, there have been many individuals who had ideas, but by spreading them and utilizing that which Hashem gave them they made a world of a difference. Over and over again, one man’s idea… one man’s vision changed the world. The great Rav Meir Shapiro was one of these individuals when he announced his idea to study Daf Yomi at the Knesiah Gedola of Agudas Yisrael in Vienna, 1923. 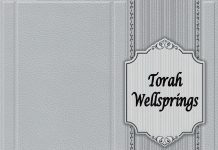 What began as a spark on inspiration, 95 years later – hundreds of millions of daffei Gemara later – has changed the world. Each person is an olam malei – a complete world, surrounded by a universe of our family and friends… this year let’s change our own world and impact the whole world… share the light of Torah, the warmth of friendship… share the gift of your unique idea and perspective… impact those around you, and change the world. A kesiva vechasima tova from the Daf Yomi Commision of Agudas Yisrael!